Method: 1. Mix dry ingredients in bowl. 2. Add wet ingredients and mix. 3. Knead dough till all is combined. 4. Make balls from dough. 5. Press in tortilla press or by hand (a heavy pan works nicely) to about 1/8" thick. 6. 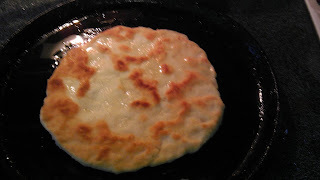 On a cast-iron skillet with oil, fry tortilla on both sides.